At the end of 6 weeks, I will start up another session called Housekeeping 201 to continue the college. 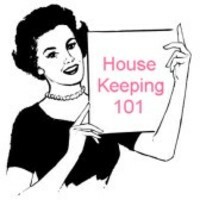 Anyone who wishes to enroll for the first time will be able to take the Housekeeping 101 course as I will repeat it concurrently. On April 28th, I will send to all participants a list of supplies for the class. Don't worry, you won't be required to purchase a Dyson or a stand mixer! No, simply things like a notebook that will be specifically for this purpose and things like that. Items you may not even have to purchase, they may already be in your possession! This will be fun, and I'm excited to see how many sign up! If anything, the packet at the end will be worth it!